From the moment he opened his eyes in the morning to the instant before he fell asleep alone at night, Mr. Henares thought only about time. He reflected about how time slowed down when he was engaged in an unpleasant activity, such as dyeing his thinning grey hair over the broken antique basin installed by his son-in-law Alvaro in his blue-tiled bathroom; and how time went faster during the rare instances when he felt happy, such as when his brace of grandchildren came for the cold weather holidays, their hypnotic music invariably loud and invigorating. Mr. Henares recalled days when time did not move at all: waking up one morning convinced that it was the exact same day as the day before, watching the red display of his tableside clock blinking fruitlessly. The experience of the twin miércoles was to be repeated thrice more, adding jueves, viernes and sábado to his list of repeating days. He endured the repeated conversations and graceless routines, read the same stories in the newspapers and watched the same interviews on television. Once, when he was a much younger man, Mr. Henares went back in time. The incident caught him completely unaware – he realized he was walking backwards and thinking thoughts in reverse. This unfortunate event flustered him so much that when it was suddenly over, he broke down in tears and resolved never to travel back in time if he could help it. One morning Mr. Henares thought about the future, methodically spooning sweetsop into his mouth and spitting out the seeds into a cup. He sat at the breakfast alcove of his house that adjoined his little shop and squinted at the sun outside the windows. Mr. Henares stood up, wiped sweetsop juice from his chin, washed his hands, crossed the connecting corridor and went about opening his shop for the day. His first visitors were a trio of young men, all sporting nose rings and dressed in last year’s affectation of jeans and tulle. “Vueño arao, Mr. Henares,” the thinnest one said, removing his Pepsi-blue hat as he entered the shop. By early evening, Mr. Henares had completed four more transactions. A young mother, fresh from the provinces, who sold all her memories of childhood: Mr. Henares’s payment was etched on a Flores bandalore, the inscription set deep in the yo-yo’s polished wooden rim. A pair of lovers, who entered his store and left it hand-in-hand, traded in five separate occasions of romance: when they first knew they were in love, when they first kissed, when they first made love, when they first reconciled, and when they decided to stay together for as long as they could, despite all inconvenience, difficulty or portent. Mr. Henares gave them, in exchange, words written on yellowed Badtz Maru stationery, sweat and ink staining the image of the little black Japanese penguin. A bored widow was next, bartering away two years of future solitude. “I’m certain someone will want that,” she said wryly, “I certainly don’t.” Mr. Henares gave her a polished citrine carved into the form of a tiny fluted flower with even smaller engraved words. The widow sniffed, “True, true,” and asked if she could purchase some romance. Mr. Henares offered her the vials he obtained from the lovers earlier. She took two and stepped out into the humidity. Mr.Henares studied the man’s resigned face and offered him, in exchange for his future pain, words woven in sawali. As he closed the shop, he reflected on how time’s ebb and flow meant different things to different people. He once had a customer, a dark-skinned young man from Cabarroquis, who protested against his good fortune in the game of love. Mr. Henares had not really been listening to him then, but was instead enraptured by the young man’s skin, marveling at the game of hide-and-seek the candlelight and shadows played upon it. It was only much later when he remembered the words the man spoke. As he prepared his frugal dinner of salted fish and boiled aubergine, Mr. Henares thought about how some people believed in time as a panacea for all hurt, all pain, all woes. A pair of sisters, veiled and somber, once asked him if he had thirty years of uninterrupted time for sale. He sadly told them he did not, that no one had ever sold him a block of personal time greater than a handful of years. But inwardly, he cringed at the notion that there were people who believed in a blessed future, guaranteed happiness by imbibing his vials or selling their sorrow, whether past or yet-to-come. He felt too old to believe in what he sold. That night, as he stripped his clothes and slipped into bed, Mr. Henares thought about how time, whether bought or sold or unsold, robbed everyone of everything in the end. He chuckled at himself, surprised by his cynical perspective, scratched at a sore spot on his spotted arms, and went to sleep, thinking about time. Three days later, on the eve of his thirty-second natal day, the storyteller Miguel Lopez Vicente came to terms with the fact that he had nothing more to write. His body of work, unmatched in terms of scope and volume, was testament to his genius, read, devoured and performed in various venues all over Hinirang. In years past, he tilled the soil of his homeland and harvested the loves and hopes of its people, transmuting their mundane lives into great dramas of passion. He listened to the tales of sailors, merchants and ambassadors to foreign lands and improved upon what he heard, spinning marvels from the barest descriptions and epics from whispered rumors. But with each year that passed, his ideas dwindled and dimished, leaving a profound void in the center of his heart. He found himself staring at virgin pages, his quill sapped by the ennui of waiting. He recalled the first time he knew he would be a writer, how the sight of farmers during rice-planting season triggered a sudden rapture in him. He remembered how the almost unbearable torrent of words rose up his body: inarticulate syllables swiftly welling up from the soles of his feet, combining into nouns at his knees, verbs at his loins, adjectives and adverbs by the time they reached his heart, joined by prepositions and articles from his hands and arms, becoming phrases, clauses then whole sentences when they reached his head, threatening to erupt not only from his lips but also seeking immediate egress from his eyes, ears and nose, before finally causing his hair to writhe as whole paragraphs, chapters, short stories, novellas, plays and novels recoiled backwards, suffusing his entire being with the terrible power of expression. The matter of age and the ravages of time had been weighing heavily on his head for the past few months. When he passed the halfway mark of a healthy man’s lifespan the year prior, he did it in a wine-induced stupor, drinking in an effort to obliterate the fact that he had written only one wondrous play the previous year. This year, he thought about doing something else, to ward off the thoughts of another year ending, a fruitless year of utter desolation - perhaps by losing himself in the arms of some unknown young man, but decided against it. A young man’s embrace would repeat a story he already knew (no doubt the boy’s arms would be strong; his skin perfect and tight; his eyes round; his life exactly the same as every other young man that Miguel had known), a futile exercise. And so Miguel simply resolved to determine his own story’s ending. The afternoon of the next day, Miguel walked to the Encanto lu Caminata to the shop of Mr. Henares. The shop was empty of people when he arrived, but filled to the rafters with all manner of jars, pots and woven baskets; vials, censers and tsino incense stick holders; beads, feathers, and boxes and bowls of various sizes, shapes and colors. A peculiar scent permeated the room, swirling slowly around a large storm lantern on the counter – the mingled smells of an eclipse, stolen kisses, and newly-opened luggage fresh from an airplane’s belly. Miguel was about to touch the lantern when he decided instead to ring the tiny porcelain bell whose intricate details seemed to never end. “Vueño arao, what can I do for you?” Mr. Henares said, appearing from an adjoining room. “All your days? Are you certain?” The old merchant looked him straight in the eye and for a moment Miguel felt himself dissolve into sad and heavy motes that just barely kept the shape of a man. “Do you know who I am?” Miguel asked him. “This way, at least, let someone benefit,” Miguel told him with an unflinching gaze. “Very well,” the old man said, before vanishing into the other room. He returned a moment later with his tools, brass and glass and wood, and took precisely the amount of time Miguel Lopez Vicente wanted to exchange. Afterwards, he handed Miguel a silver thimble, discolored and slightly dented. “I am aware of that story,” Miguel sighed as he looked closely at the thimble for the inscription. “Of course. Of course, you are,” Mr. Henares nodded, scratching at a sore on his left arm. He left Miguel alone to read. There is a reason why past is past. That night at his home, Miguel Lopez Vicente dismissed his maidservant early, mixed water with his last supper’s vino, a simple claret from the vineyards of Sevilla in Ispancio, undressed himself, taking care to empty his bowels beforehand to maintain a semblance of dignity for the benefit of those who would find him, and stretched out on his lonely bed built for two. His final thoughts, as he slipped into a dreamless sleep, were how he wished he was a man half his age again, at the height of his powers. That bittersweet conceit kept him occupied as cold seawater rushed to submerge his bed. And so his story ended. Whatever words Miguel had suddenly dried on his tongue as he watched the boy disrobe. “You only turn sixteen once. It should be special. It will be special.” The boy had crossed the distance between them in the span of a thunderous heartbeat and Miguel shuddered when he felt the intense heat the boy seemed to radiate. He did not know if it was the result of his imagination or barely controlled desire but he feared that he would burn. “You cannot possibly be older than me,” Miguel said, casting his gaze to the side, suddenly conscious of the boy’s nearness. “I-“ Miguel began, but as the boy’s fingers found his skin he lost all words, the language abandoning him to the trails of heat left by the boy’s explorations. When their tongues met, he was certain he would be consumed by fire, losing himself in the intense moment of unadulterated sunlight that reduced everything that he was into a throbbing cinder, wanting only the explosive release that was as inevitable as life and death. “Never leave me,” he told the boy. Later, after his birthday gift had left, he lay trembling in a bed built for one, his body weak with the demarcation of new frontiers, while his soul, not quite anywhere, exulted in the epiphany that he was his own boundary and that it was as wide or as narrow as he wanted. What Miguel Lopez Vicente did not know, what he could not know, was that his heart was ill-suited for single night’s passion. It was fragile and tender and rare, wanting only true love, and collapsed upon itself, heavy with imagined loss in the small hours before dawn, feeling lost, betrayed and old before its time. When Miguel Lopez Vicente turned eight, his father brought him to see the End of the World. The spectacle, held only once every generation and lasting for fourteen nights, was staged on a massive series of sculpted sets within the Baluarte of the Plaza Miranda. Ciudad Manila spared no expense – the costumed cast numbered in the hundreds and great machines, made invisible by cloth and convention, spew fire, blew wind and rained artificial hailstones the size of macopas but with the consistency of cotton. The Beast of the Apocalypse (a magnificent contraption maneuvered by three alternating shifts of eighteen people) towered over the amazed audience, clawing its way out of a bottomless pit; its words and imprecations resounded with the voice of the Most Excellent Primo Orador herself. Much of the performance went over Miguel Lopez Vicente’s head; instead he was terrified by the sights and sounds of the Apocalypse, much to his father’s regret. “Did you not enjoy the show?” Antonio Manuel Vicente asked him afterwards, visibly irritated at his son’s obvious pallor. “Yes, Papa,” Miguel lied with little difficulty. “Yes, Papa,” Miguel replied, but in his heart he had decided never to grow old. When they returned home, Miguel rushed to his room and trembled in a corner, his thoughts ablaze with images of endings and destruction. He cried for over an hour, caught off-guard by the tears his fear provoked, feeling helpless, alone and destined to die in the Apocalypse that could occur tomorrow or the day after that. The young boy turned his back on the faith of his father that day, with the fierce determination of the very young, and resolved that he would rather die than live to see the End of the World. Before he went to sleep, he deliberately did not say his bedtime prayers and turned the statue of the Three Sisters away from his bed. He did not want them watching him. The Apocalypse arrived that night, triggered by the loss of one little boy’s faith. In their fury, radiant devas came to Miguel’s room on shimmering wings, shattering the walls of the house. “So this is the one who brought about the End of Things,” the fiercest among them said, pointing to the sleeping boy with a sword that burned with a flame unseen since the Beginning of All Things. With a soundless cry she struck down the remnants of the house then flew with her legion into the sky that wept stars. Miguel Lopez Vicente’s mother, dead just a week, came to him on the eve of his fourth birthday, saying something her son could not quite hear. He sat up, straining to listen to her words, having no fear of the woman who had shown him only love. When his mother kissed him on the forehead, Miguel felt suddenly cold and embraced her, his heavy heart, lately engorged by sorrow, shrinking to the size of a child’s perfect love. “You are the only one I have ever loved, my Miguel,” she told him as they stepped into the shadows. Miguel set his face into a smile of unconditional trust and walked forward. Antonio Manuel Vicente, the rising dramatist, stood at the balcony of his tower residence and contemplated his life, like pages in a chapbook he felt he had only partially authored. A soft wind, heavy with the suggestion of salt, blew in from the nearby harbor, carrying muted voices that sang, argued, lied or whispered promises. He pulled his dressing robe closer to his body, thinking about the sad and strange paths his life had taken, the people he had loved and left behind, and how the simplicity of a change of perspective –the height of a balcony – could provoke thoughts of drastic action. In his arms he carried his sleeping son, Miguel; a two-year-old result of a dalliance with a woman he could honestly not remember. He had found the boy sitting alone, silent and stone-faced, on the stairs of his residence, with a brief letter that held even briefer introductions. That was a week ago. Antonio had his entire life before him and felt that the unwelcome weight in his arms was an unfair burden. When he felt his son stir in his arms, he summoned up all the paternal inclinations in his heart and came up with an absolute emptiness. He looked at the son he had never wanted, never even dreamed of, and without a single other thought, hurled him off the balcony. He felt no remorse, prepared to act the distraught parent when tomorrow brought news of the horrible accident to his ears, already composing the lines of dialogue that he, grief-stricken, would speak. Miguel Lopez Vicente watched the ground rush up to welcome him with the same stoicism he had when he was abandoned by his mother. In the storeroom of his shop along the Encanto lu Caminata, Mr .Henares looked at the eighty four vials he had distilled from the future days of his largest customer of the year. He gently swirled the closest one between thumb and forefinger and watched the marvelous stories of Miguel Lopez Vicente unfold in a glimmer of effervesce, liquid tales brimming with potential. He paused and thought about the nature of stories, the vagaries of time and the single, long road of desire and shook his head, resigned to the fact that for as long as people were people, his business would continue. Mr. Henares replaced the vial of Miguel Lopez Vicente among the eighty-three others, put off for the next day the task of determining their relative prices (perhaps he would bundle two or three – one of his regulars, a famous astronomer when he was young, wanted some more time for stargazing), and went about closing the shop. “We all burn sunlight,” he muttered to no one in particular, scratching an arm with a motion that could almost be mistaken as a caress. 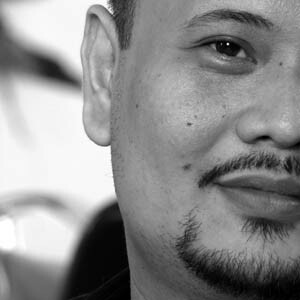 Dean Francis Alfar’s plays have been performed in venues across the Philippines, while his fiction has been published both locally and abroad, including Strange Horizons, Rabid Transit and The Year’s Best Fantasy and Horror. 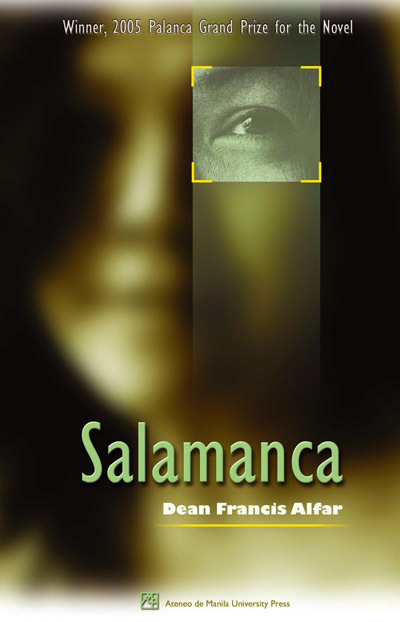 He has won nine Don Carlos Palanca Memorial Awards for Literature – including the Grand Prize for Novel for Salamanca (Ateneo Press, 2006) - and the Manila Critics’ Circle National Book Award for the graphic novel Siglo: Freedom. 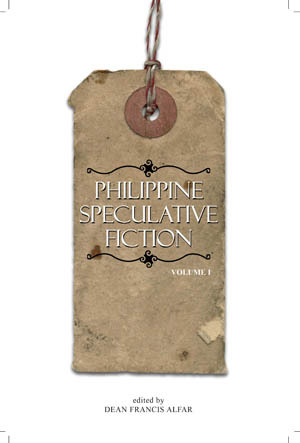 He is an advocate of the literature of the fantastic, recently editing the first Philippine Speculative Fiction anthology. Alfar is also a comic book creator and an inveterate blogger. His collection of short fiction, The Kite of Stars and Other Stories, is slated for publication next year. He lives in Manila with his wife Nikki and their daughter Sage. And just out, his deliciously delightful short story "The Middle Prince" in the September 2006 Bewildering Stories. I hope to feature more Alfar in the future. "Terminós" copyright © 2005-2006 by Dean Francis Alfar, was first published in RabidTransit. This short story appears here with thanks to Dean Francis Alfar, whose payment was less than a brass razoo.